Our science dinner will be an opportunity to see Savannah from a different point of view – onboard a Savannah Riverboat! 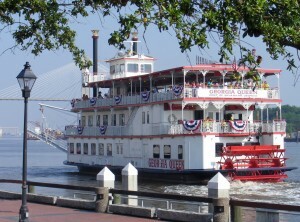 Within a 15-minute river walk (6 blocks) of our conference hotel, we will board one of Savannah’s historic riverboats, a replica of a 19th century stern-wheel riverboat. We will cruise gently down the Savannah River under the famous Talmadge Memorial Bridge to the lively port area (4th largest industrial shipping port in the USA), and back. It is a new moon that evening, so the stars will be on full display! The dinner buffet will feature a variety of delicious Southern specialties. Tickets: $50. Reservations are required. Please sign up and pay for this event on the Registration Form. Everyone is encouraged to attend and guests are welcome.